I'VE been kept busy with the family and animals. Happy B'day to all the monkeys that are or have been celebrating.Old age is catching up with me . Damn I'll be 68 in January. Sister I am keeping you, Connie and George in my prayers. Don't overdo on your Christmas preparations. Remember the reason for the season. 4Donks so good to hear from you. Prayers for you , the family and the fur babies. You aren't getting old you have to young a heart to get old. Good to see you 4 Donks! Unlike Green Eyes, I have barely begun my Christmas shopping! I think we'll put the tree up next weekend. Not going to do the outside decorations this year. Well, maybe just a few things. This Christmas is going to be a light Christmas, since this year was a heavy year with so many extra unexpected expenses. Gonna try to keep in mind the reason for the season, 4 Donks! Sounds like he will still receive it before his birthday? If not, it will just be a day late, I think. It's the thought that counts, GE! Yes you did a screen shot of it for me because I couldn't save the picture. Thank You again for doing that. I called FedEx and fixed the number. Then they just called back to verify the right number and said it would be there Monday. It will get there before his birthday. I was hoping for today as his Cousin was going to be there to take pictures for me when he opened it. Oh well he will get it. We are all betting here that he takes a picture of himself wearing it and sends it me. Thank you 4Donks. I do so appreciate the prayers from you and all my monkey friends. You're not much older than me. I am 64! Yes, Jesus is the reason for every season. Thanks for the thoughts and prayers. It went really well. George is a little sad this afternoon -- but I have always known how to cheer him up! Is anything like how JSM cheers me up??? I seriously doubt it -- but if it is making you laugh we are on the same page! Sister I see CC is being a silly again. My son got his birthday present today. 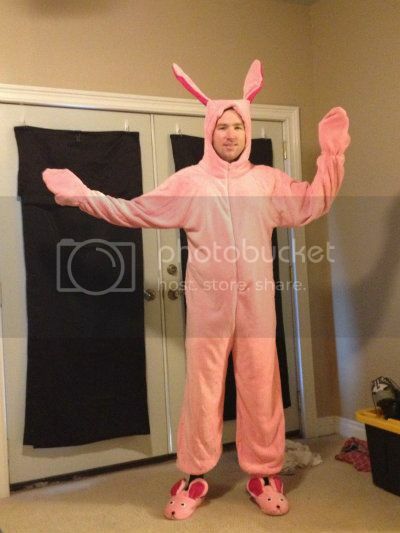 He called as soon as he opened it and saw it was the bunny suit from Christmas Story. Put it on and said it was warm that was for sure. It is a little short in the legs. Although they said it fit up to 6' 4" He was going out today to try and find him some pink socks. Told me he was wearing it out to some bar/restaurant he goes to for his birthday. ::MonkeyHaHa::Here is my son modeling is birthday present I love him to pieces. Now that's funny right there!!! The pink bunny slippers definitely complete the ensemble! Brandi...so sorry for the loss of your brother.. Thank you very much, cookie. Hope everyone is doing well. Going to Connie's today to put up Christmas! Blessings and prayers for all. Glad everyone got a smile out of my son in his Bunny Suit. Sister enjoy your day with Connie. Do you want to come here and decorate for Christmas? Prayers for all the monkeys that need them. Hope every ones doing well. Didn't make it to Connie's -- up to my eyeballs in paperwork for our annual reporting. Aaargh! I dislike the administrative work so much! This too will pass . . . I hope!